« Are property prices poised to head South this winter? Let’s face it, real estate markets have been boring since the financial crisis. Once the government intervened by dropping rates to crisis levels and bailing out banks and distressed borrowers, the markets have been anything but normal. The goal of the government stimulus was to reflate asset prices and make people think this was a true recovery. Not only has this not been a real recovery, but people have forgotten what “normal” rates look like and what would happen if they ever moved higher. For the first time in years, anyone buying or selling property may actually have to do some homework. Mortgage rates are beginning to normalize on their own and real estate markets may actually be fun again! After luring everyone back into the real estate market with these artificially low rates, we have recently seen an unprecedented rise in bond yields. These increases will put the brakes on the housing market and deflate the existing bubble. Plenty of speculators rushed into the markets and will once again be stuck with properties they thought would be quick flips. Does this sound familiar? 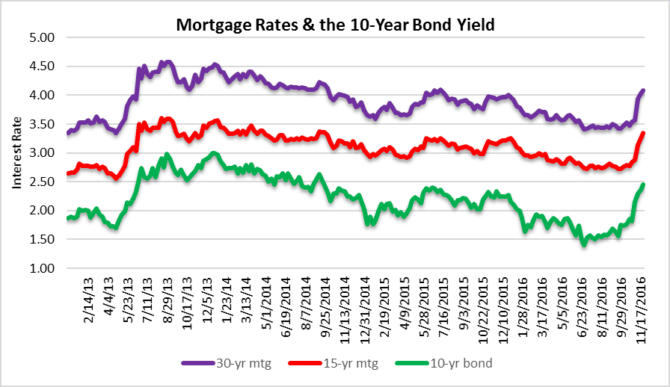 Look at the far right side of this chart of bond yields and mortgage rates. We haven’t seen the 10-year bond (where it is today) at 2.45 since October of 2014. We will see if it closes there today and if it does, it will most likely continue the trek upward. The real fun begins after the 10-year bond yield climbs over 3% and mortgage rates move closer to 5%. We focus on the closed sales because they are a good leading indicator for where prices are heading. If sales volume declines for several months in a row, prices will typically follow them down. here is a snapshot of the Greater Fort Lauderdale residential market for single-family homes. 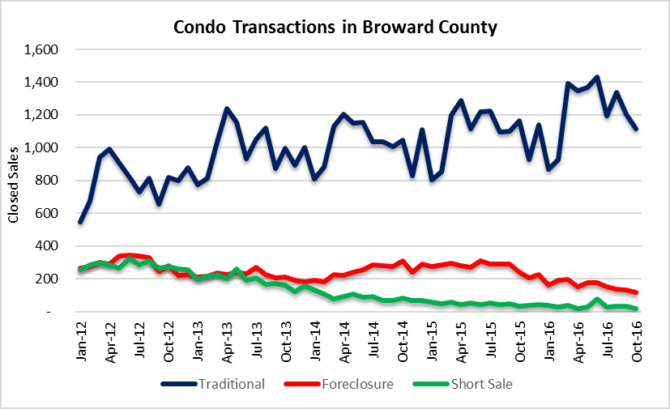 Traditional (arm’s length) transactions are usually the best indicator and they have dropped 30% since June, when we believe the residential market peaked in South Florida. Keep in mind that these numbers are just through October, before bond yields and mortgage rates made their dramatic jump. Now let’s take a look at condo sales and you will notice a similar pattern. Traditional condo sales declined 22% since the month of June. Prices of houses and condos haven’t seen the impact of higher borrowing costs yet and therefore have not dropped. Our prediction is the the November sales numbers out later this month will start to really show some cracks in the market. Condo prices started to slip a few months ago, but the single-family homes held up through October. November, December and 2017 should bring an end to their Fed-induced price rally. 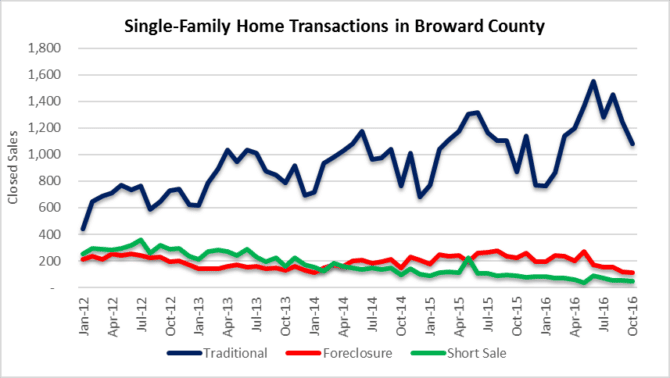 We have included a bonus chart today, because most people think that foreclosures will no longer impact the South Florida market. Think again. After years of kicking the can down the road, some of the foreclosures from 2008 will eventually get to the market. 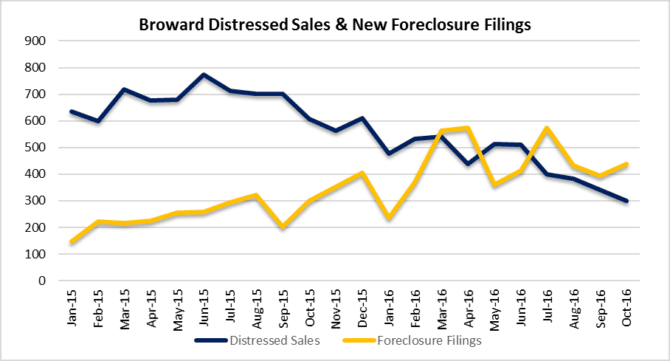 This final chart shows that although distressed sales have been declining, new foreclosure filings have been creeping higher. This trend is worth watching as we move into 2017. 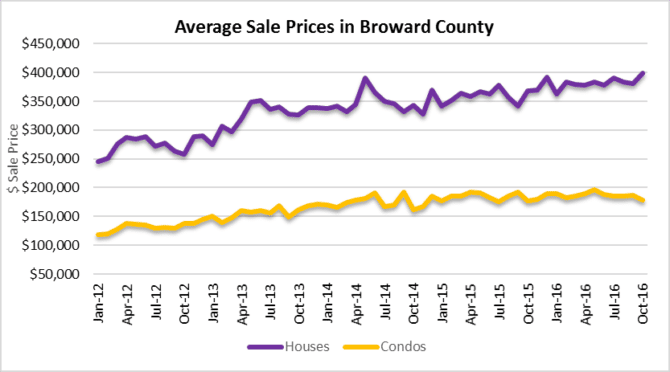 This entry was posted in Foreclosure activity, Fort Lauderdale foreclosures, Fort Lauderdale real estate, Market Insight, South Florida Real Estate and tagged condo prices, Fort Lauderdale real estate, home prices, housing bubble, mortgage rates. Bookmark the permalink. Trackbacks are closed, but you can post a comment.